Because angiogenesis plays a major role in the perpetuation of inflammatory arthritis, we explored a method for selectively targeting and destroying new synovial blood vessels. Mice with collagen-induced arthritis were injected intravenously with phage expressing an RGD motif. In addition, the RGD peptide (RGD-4C) was covalently linked to a proapoptotic heptapeptide dimer, D(KLAKLAK)2, and was systemically administered to mice with collagen-induced arthritis. A phage displaying an RGD-containing cyclic peptide (RGD-4C) that binds selectively to the αvβ3 and αvβ5 integrins accumulated in inflamed synovium but not in normal synovium. 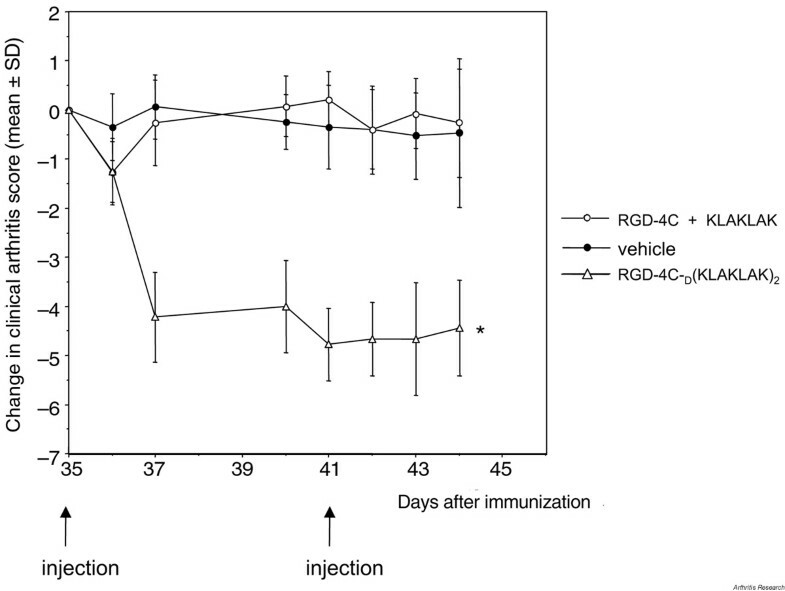 Homing of RGD-4C phage to inflamed synovium was inhibited by co-administration of soluble RGD-4C. Intravenous injections of the RGD-4C–D(KLAKLAK)2 chimeric peptide significantly decreased clinical arthritis and increased apoptosis of synovial blood vessels, whereas treatment with vehicle or uncoupled mixture of the RGD-4C and the untargeted proapoptotic peptide had no effect. Targeted apoptosis of synovial neovasculature can induce apoptosis and suppress clinical arthritis. This form of therapy has potential utility in the treatment of inflammatory arthritis. In rheumatoid arthritis (RA), the synovium is characterized by hyperplasia of the intimal lining and mononuclear infiltration of the sublining, leading to erosion of cartilage and subchondral bone by invasive pannus . Angiogenesis plays a crucial role in the formation of pannus, and the extensive network of blood vessels facilitates recruitment of mononuclear cells . Proangiogenic mediators found in RA synovial tissue regulate migration and proliferation of endothelial cells. In addition, αvβ3 and αvβ5 integrins are important in angiogenesis [3,4,5]. αvβ3 is expressed on synovial blood vessels in rheumatoid arthritis [6,7], and αv antagonists injected directly into the joint suppress synovitis in rabbits . Therefore, targeted induction of apoptosis in the neovasculature is a potential therapy for RA . We evaluated a novel method of targeted drug delivery to inflamed joints using peptides that selectively bind to neo-vasculature . Our data show that a constrained cyclic RGD peptide that binds to αvβ3 and αvβ5 integrins  homes to blood vessels in inflamed synovium after systemic administration. This peptide was covalently linked to a 14-amino-acid proapoptotic peptide and successfully suppressed arthritis in collagen-induced arthritis (CIA). Insertless fd phage and phage presenting the peptide CDCRGDCFC (RGD-4C) was prepared as previously described elsewhere [10,11,12]. The chemical structure of RGD-4C was determined by NMR analysis and is described in detail elsewhere . K91kan bacteria were a gift from G Smith. The peptides RGD-4C, CARAC,D(KLAKLAKKLAKLAK) [designated D(KLAKLAK)2], and CDCRGDCFC-GG-D(KLAKLAKKALKLAK) [designated RGD-4C-D(KLAKLAK)2] were synthesized by AnaSpec, Inc (San Jose, CA, USA). CIA was induced in 6- to 8-week-old male DBA/1J mice (Jackson Laboratory, Bar Harbor, ME, USA), as previously described [14,15]. To determine homing characteristics of the RGD-4C phage in vivo, mice with CIA on day 35 after immunization were anesthetized and injected with 200 µl of medium containing 1010 transducing units (TU) of phage into the tail vein. After 5 min, the mice were perfused with 5 ml of medium given through the right atrium. The organs of interest and synovia were pooled, homogenized, incubated with K91kan bacteria for 30 min, and plated on tetracycline plates. Phage enrichment was calculated as the ratio of TU/g of synovial tissue divided by the TU/g of brain tissue. Because animals are perfused and sacrificed within minutes after administration, relative rates of penetration into the target tissue do not influence this assay system (i.e., the target is the intravascular surface of the blood vessels). For the competitive peptide inhibition studies, the phage was injected with either 1 mg of the RGD-4C peptide or with 1 mg of a control peptide, CARAC . Unimmunized mice were used as normal controls. In the clinical efficacy study, mice with established CIA were anesthetized and injected intravenously on days 35 and 41 with either 500 µg of covalently linked RGD-4C-D(KLAKLAK)2 dissolved in 500 µl DMEM (N = 14), with a mixture of the equimolar amounts of uncoupled RGD-4C and D(KLAKLAK)2 dissolved in 500 µl DMEM (N = 20), or with 500 µl DMEM only (N = 20). The clinical arthritis scores were assessed daily in a blinded manner using a semiquantitative scoring system from 0 to 4+ for each paw (maximum score) [14,15]. Mice were sacrificed on day 35 after immunization and their paws and internal organs were fixed in a 10% formalin solution for 24 hours, decalcified, and embedded in paraffin. The primary antibodies (horseradish peroxidase/anti-M13 monoclonal conjugate [Pharmacia Biotech, Piscataway, NJ, USA], rabbit anti-av antibody ) and secondary antibody (swine anti-rabbit-AP; Dako, Glostrup, Denmark) were diluted in 2% BSA-PBS. Peroxidase activity was detected using 3,3' diaminobenzidine, and alkaline phosphatase activity was detected using alkaline phosphatase kit III (Vector Laboratories Inc, Burlingame, CA, USA). The paws of the animals treated with vehicle or 500 µg of RGD-4C coupled to D(KLAKLAK)2 were fixed in a 10% formalin solution, decalcified for 14 days in a 15% EDTA-PBS solution at 4ºC, and embedded in paraffin. Sections (5 µm) were incubated with proteinase K (20 µg/ml) for 20 minutes. The In situ Death Detection Kit from Boehringer Mannheim GmbH (Mannheim, Germany) was used in accordance with the manufacturer's instructions. RGD-4C phage was injected intravenously into DBA/1J mice with active CIA on day 35 (N = 18). Control mice with CIA received insertless fd phage (N = 14). After circulation of the phage and perfusion with medium, the control organ (the brain) and synovium from arthritic joints were surgically dissected and phage enrichment was calculated as the ratio of TU/g of synovial tissue to TU/g of control tissue. Accumulation of the RGD-4C phage in inflamed synovium was 8.0 ± 1.7 (mean ± standard deviation) fold that in brain (P < 0.01). For the control phage, this value was 1.5 ± 0.3 (Fig.1). Neither the RGD-4C phage nor the control phage accumulated in synovium of normal DBA/1J mice (N = 6 and 5, respectively; P < 0.0001 compared with inflamed synovium). Other organs (lung, liver, spleen, heart, kidney, pancreas, and gut) were also tested for enrichment of the RGD-4C and control phage. There was no selective accumulation of the RGD-4C phage in these organs (data not shown). Phage homing to inflamed synovium. DBA/1J mice with ('inflamed') and without ('normal') collagen-induced arthritis were injected intravenously on day 35 with 1010 transducing units (TU) of phage expressing RGD-4C on their surface and control phage. Phage enrichment was calculated as the ratio of TU/g in synovial tissue to TU/g in brain tissue. 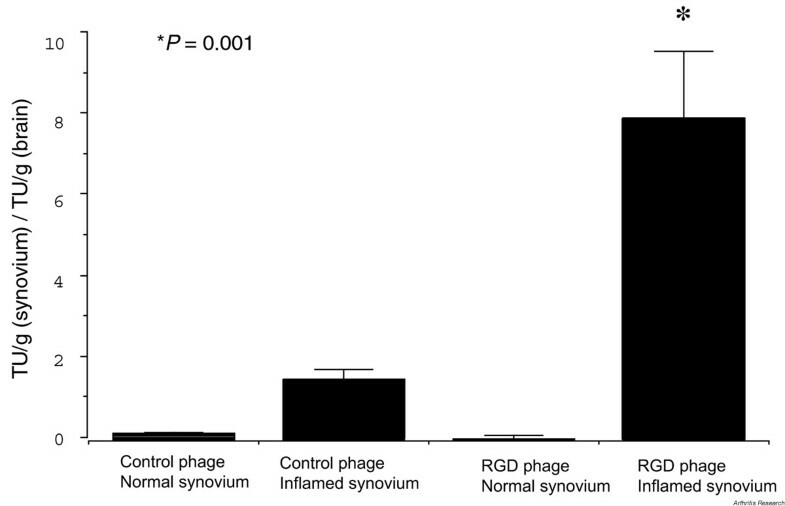 RGD-4C phage accumulate in inflamed synovium, but not in normal synovium (P < 0.0001). After showing that the RGD-4C phage targets inflamed synovium, we assessed the specificity of homing using the soluble RGD-4C peptide, a competitive inhibitor. The RGD-4C phage was co-injected with 1 mg of either the RGD-4C peptide (N = 5) or a control peptide (CARAC; N = 5). 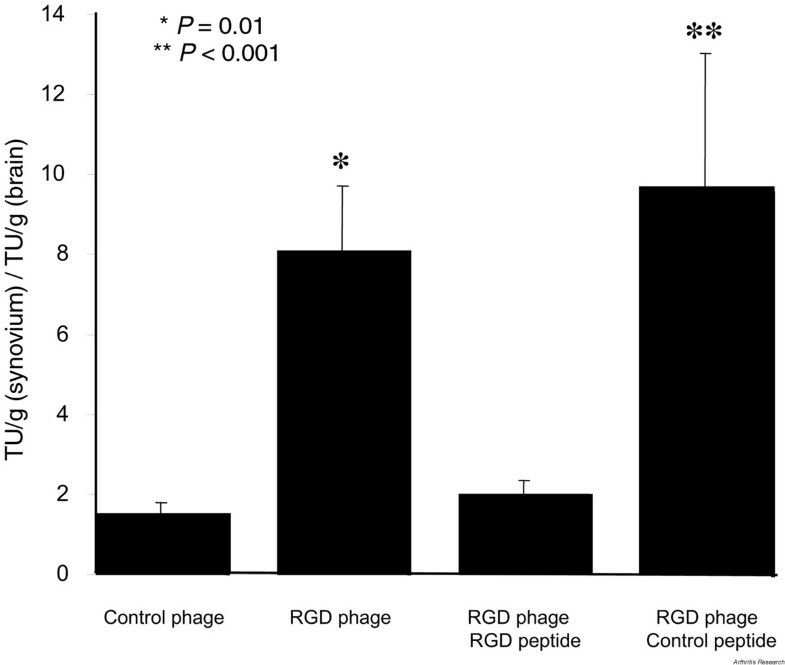 Figure 2 shows that soluble RGD-4C peptide, but not the control peptide, blocked accumulation of the RGD-4C phage in inflamed synovium. Inhibition of RGD-4C phage homing with the cognate soluble peptide. In competitive peptide inhibition studies in mice with collagen-induced arthritis, RGD-4C phage ('RGD phage') was co-injected with 1 mg of either RGD-4C peptide or control peptide (CARAC). Note accumulation of RGD-4C phage in inflamed synovium (P < 0.01). The localization of RGD-4C phage in synovium was examined in more detail by immunohistochemistry. Staining of paraffin-embedded sections revealed localization of RGD-4C-expressing phage to small vessels in the sublining of the inflamed synovium (Fig. 3a). Expression of the integrins containing αv was also observed in the small vessels in the inflamed synovial sublining (Fig. 3b). Immunohistologic analysis did not reveal phage in the synovium of normal mice injected with the RGD-4C phage. Detection of RGD-4C-phage, αvβ3, and TUNEL positive cells in synovial blood vessels. Mice with established collagen-induced arthritis were injected with RGD-4C and sections were stained for (a) phage (blue blood vessels, denoted here by arrows) or (b) –vβ3 (brown blood vessels, denoted here by arrows) by immunohistochemistry. In a second experiment, mice with collagen-induced arthritis were given RGD-4C-D(KLAKLAK)2 on day 35 and TUNEL assays were performed on day 38. Positive cells were found in sublining vessels of inflamed synovium in the animals treated with RGD-4C-D(KLAKLAK)2 (arrows) (c) but not in the control animals (not shown). DBA/1J mice with CIA were administered a chimeric compound consisting of the peptide RGD-4C covalently linked to the proapoptotic peptide D(KLAKLAK)2 . The chimeric compound was injected intravenously on days 35 and 41. Control mice with CIA were either injected with the vehicle or were co-injected with similar quantities of the uncoupled RGD-4C and D(KLAKLAK)2 peptides. The mean pretreatment score was 10.3 ± 0.5. Neither the vehicle nor the uncoupled mixture of RGD-4C with D(KLAKLAK)2 had no effect on arthritis, whereas the targeted chimeric compound significantly decreased clinical arthritis on day 44 (P < 0.001; Fig. 4). Changes in clinical arthritis scores in mice with collagen-induced arthritis after treatment with peptides or the vehicle. Mice were injected intravenously on days 35 and 41 with either the targeted proapoptotic chimeric peptide RGD-4C-D(KLAKLAK)2 or a mixture of the uncoupled peptides RGD-4C and D(KLAKLAK)2 or the vehicle. Clinical arthritis scores were evaluated using a scale of 0 to 4+ for each paw (maximum = 16). The mean pretreatment score was 10.3 ± 0.5. TUNEL studies were performed on joint specimens collected 72 hours after intravenous injection of the chimeric peptide. Abundant positive cells were detected in small vessels of the inflamed synovium (Fig. 3c) but not in synovium of arthritic mice injected with vehicle (not shown). Positive cells were not found in lung, liver, or spleen of chimera-treated arthritic mice, indicating that apoptosis was selective to inflamed synovium. Angiogenesis has been implicated in inflammatory diseases such as RA [2,8]. Synovial tissues from patients with RA express more of the angiogenesis marker, αvβ3 integrin, than control synovium [6,7,18]. An angiostatic compound suppressed arthritis in rat adjuvant arthritis and CIA [19,20], and intra-articular administration of an RGD peptide that binds to αvβ3 decreased synovial inflammation in a rabbit model of arthritis . The homing properties of the cyclic RGD peptide allowed us to deliver a toxic agent – the proaptotic peptide D(KLAKLAK)2 – to the synovial microvasculature through systemic administration. Homing minimized systemic toxicity in this model, as has been found in experimental tumor treatments [9,16]. Systemic treatment with RGD peptides that are selective for αvβ3 reduces angiogenesis, presumably by blocking the function of the integrin . However, the systemic administration of free RGD-4C peptide had no effect on arthritis, indicating that the RGD-4C merely acts to target the proapoptotic peptide. The RGD-4C peptide also enhances internalization of RGD-4C–D(KLAKLAK)2 . When covalently linked to the homing peptide RGD-4C, the proapoptotic peptide enters cells that express αvβ3 or αvβ5 . Once in the cytoplasm, it disrupts mitochondrial membranes and initiates apoptosis . Distribution studies in vivo followed by cell fractionation indicate that RGD-4C–D(KLAKLAK)2 localizes to mitochondrial membranes of the target cells but not to endothelial cells in control tissues . Cells that do not express these integrins are spared, because the proapoptotic peptide alone is not internalized. As with our studies, Pasqualini and colleagues showed that αv-directed RGD-4C phage is not detected in normal tissues, but accumulates on the surface of tumor blood vessels . Intravenous treatment of mice with established arthritis using RGD-4C–D(KLAKLAK)2 induced apoptosis of endothelial cells in the inflamed synovium. This was associated with decreased severity of arthritis compared with untreated mice or mice treated with a mixture of uncoupled RGD-4C and D(KLAKLAK)2 peptides. Since we did not observe systemic toxicity and did not find apoptotic cells in other tissues besides the inflamed synovium, RGD-4C–D(KLAKLAK)2 appears to have a favorable pharmacological profile. These data support the feasibility of administering systemic agents that home to sites of inflammation as a means of delivering a therapeutic agent. This approach can treat multiple sites simultaneously while not accumulating in normal tissues. Our study is the first example of selective proapoptotic treatment of an inflammatory disease using homing peptides and could potentially be used to deliver therapeutic agents to inflamed joints. This work was supported by grants CA 74238 and Cancer Center Support Grant CA30199 (ER) and grants from the NIH (AR45347 and AR44850) and a Biomedical Sciences Award from the Arthritis Foundation (GSF). EB was supported by the Deutsche Forschungsgemeinschaft.